Introduction: Severe preeclampsia is one of the most serious pathologies during pregnancy, with heavy morbidity and maternal-fetal mortality. The aim of our study was to help improve the management of severe preeclampsia. Methods: We conducted a cross-sectional analytical study from 1st September 2015 to 30th August 2016, at the Obstetrics and Gynecology Department of the Hôpital communautaire of Bangui. The study population was pregnant and parturient patients with severe pre-eclampsia. Results: Out of 4021 registered cases, 41 met the inclusion criteria, with a prevalence of 1.0%. The primiparous were the most represented (48.8%). Magnesium sulfate was the most used as an anticonvulsant (70.7%) and dihydralazine was the most used for the High Blood Pressure (HBP). The main complications of pre-eclampsia were eclampsia (29.3%) and acute renal failure (19.5%). Overall, maternal mortality was 9.8% and perinatal mortality was 31.7%. Conclusion: The complications of severe preeclampsia are common in our study. The maternal and fetal prognosis remains a concern. Hence, we suggest early screening of pre-eclampsia symptoms during prenatal consultations to improve pregnancy outcome. Severe preeclampsia is one of the dreaded complications of High Blood Pressure (HBP) during pregnancy, with heavy mortality and maternal-fetal morbidity. Worldwide, complications of HBP on pregnancy are the third leading cause of maternal mortality . While the incidence of severe preeclampsia is low in Western Europe with 3% and 5% , in Africa, the frequency varies between 5% to 10% . The diagnosis of preeclampsia is early in developed countries while in Africa the screening of such morbidity is often achieved at the stage of obstetric complications. Moreover, the weakness of health care implies its burden in developing countries . In the Central African Republic, there is no published data about clinical aspects of severe preeclampsia. Hence, this study aimed to assess the extent and prognosis of severe preeclampsia in the Gynecology-Obstetrics Department of the Centre hospitals- Universitaire of Bangui, the Central African Republic. Pregnancy with more than 24 weeks of amenorrhea or a parturient with 1 severe high blood pressure at ≥ 160 mmHg for systolic blood pressure and/or ≥ 110 mmHg for diastolic blood pressure; 2 renal failure with oliguria (<500 ml/day) or azotemia >135 μmol/l or proteinuria ≥ 3 g/day; 3 eclampsia or neurological disorders; 4 recurrent intrauterine growth retardation or fetal heart rate alteration. Women with moderate preeclampsia were excluded from this study. A sample size of this study was exhaustive. The treatment for the severe preeclampsia was symptomatic: injectable dihydralazine and clonidine, followed by methyl-dopa orally, in association with magnesium sulfate in case of eclampsia.This treatment was associated with the monitoring of the blood pressure, evaluating the maternal-fetal impact, extracting the fetus on a case-bycase based to the clinical evolution and finally, taking care of any complications that ensue. Data collection was performed using a structured questionnaire. The data was entered and analyzed on the Epi-info version 3.5.4 database and analyzed with SPSS. Pearson's Chi2 comparison statistical tests were performed and the threshold of statistical significance was 5%. The total number of 4021 pregnant and parturient was recorded during the study period with 92 cases of preeclampsia (2.3% or 92/4021) among which 41 were severe cases (4.5% or 41/92). The age average was 27 years (extremes: 16 and 41 years). The primiparous were the most frequent (53.6%). Prenatal follow-up was achieved in 75.6% of the patients. The average number of hospitalization period of these patients was 10 days (Table 1). Table 1: Socio-demographic profile of patients (age, parity, prenatal follow-up). The higher number of cases of pre-eclampsia was observed in our study during the period from January to March (Figure 1). 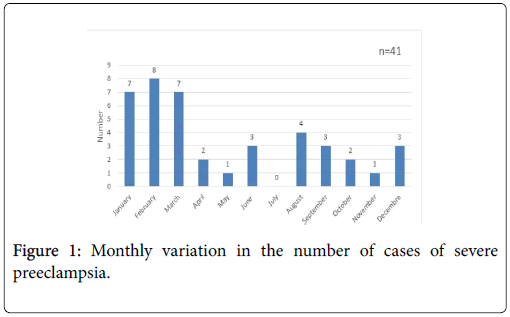 Figure 1: Monthly variation in the number of cases of severe preeclampsia. Eclampsia occurred in 12 (29.3%) patients and renal failure was observed in (8) 19.5% patients. Preterm delivery and acute fetal distress were the most observed complications with the proportion of 26.2% and 23.8%, respectively (Table 2). Table 2: Distribution of patients by maternal and fetal complications. The vaginal delivery was achieved for a proportion of 53% of patients. Perinatal and maternal deaths accounted for 28.6% and 9.7%, respectively. The proportion of antenatal deaths was higher among parturient women who did not attend antenatal consultations (P=0.000136) (Table 3). Table 3: Association between prenatal consultation, maternal death, and perinatal death. The risk of seizure was lowest in parturient women who received preventive treatment with magnesium sulfate than in those without such treatment (P=0.004) (Table 4). Table 4: Association between treatment received and the occurrence of eclampsia crisis. This study showed that preeclampsia is the important cardiovascular diseases associated with pregnancy . In this study, the prevalence of preeclampsia was 1%, similar to that of Maroc , this frequency is lower than that found in Dakar, Samake in Bamako, Tchaou in Cotonou and Coulibaly in Abidjan which were 14.9%, 7.8%, 4.7% and 12.3%, respectively [4-8]. This discrepancy could be explained by the difference in the case definition of severe preeclampsia used in these studies. The high number of severe preeclampsia observed during the period from January to March should be due to the cool climate during this period in Bangui. Indeed, the climate with low temperatures is one of the circumstances which influence the occurrence of preeclampsia [9,10]. However, this result differs from that found in Abidjan where most preeclampsia cases are found during the rainy and hot season . We found a high incidence of severe pre-eclampsia in parturient women aged above 20 years with a peak at 27 years, which is contrary to the finding of Adisso and collaborators in Cotonou in 2002 who observed a peak at 20 years followed by decreasing trend after this age threshold . Indeed, young parturient women are at high risk of preeclampsia. Our results corroborate that of Cisse and collaborators in Dakar who had found a double-bump distribution with a peak in women aged 25 years and a second pick at 35 years . Furthermore, the primiparous were mostly affected, and this result is consistent with data from two studies in Yaounde which reported the proportion of 46%, 20%, and 41,34%, respectively [12,13]. The predominance of primiparous women supports the hypothesis that the role attributed to some early maternal immune intolerance to the first pregnancy development [14,15]. The lack of attendance to the antenatal consultations was significantly associated with the accuracy of severe preeclampsia. Indeed, his main purpose of prenatal consultations is to detect precociously morbidities during pregnancy. However, in Yaounde, Mboudou and collaborators did find that the number of antenatal visits did not influence the progression of moderate preeclampsia to severe form . This may cast doubt on the quality of prenatal consultations but also recall the unpredictable evolution of preeclampsia. This corroborates the data from the literature . The antihypertensive drugs used in this study was justified by local availability and affordability. Indeed, there is no consensus among clinicians about the choice of antihypertensive agents during pregnancy in accordance with the mother and the fetus safe [17,18]. Lokossou in Cotonou stated that clonidine should no longer be used [19-21]. The antihypertensive drugs used in our study are similar to that used in the United States of America and Senegal where dihydralazine is the most preferred [18-20], while current antihypertensives are relatively reliable in the treatment of high blood pressure in non-pregnant patients . In our study, magnesium sulfate was used to prevent eclamptic seizures based on functional signs, and/or blood pressure as suggested by Roberts and collaborators , and based also to the formal recommendations experts in 2009 ; during convulsive seizures and afterward to prevent recurrence. The clinical evolution was satisfactory in this study. However, in Senegal, Cisse and collaborators did not found similar results with magnesium sulfate . The maternal complications (eclampsia occurred and renal failure) found in our study are not almost comparable to those generally described elsewhere, with a relatively low frequency in developed countries  and in Senegal . Acute fetal distress and premature delivery were the most observed fetal complications. In Congo, a frequency of 37.5% fetal distress and 43.75% premature delivery . The maternal mortality recorded is mainly due to the occurrence eclampsia associated with the cerebral vascular accident. The maternal lethality found in this study was higher than that of other studies, with 7.3% previously in Bangui, 8.8% in Congo, 7.1% in Bamako, 5.3% in Guinea Conakry and 2.5% in France [25-29]. However, other studies reported relatively very higher maternal lethality frequencies: 17.9% in Côte d'Ivoire, 17.9% in Senegal, 15.7% in Burkina Faso, 21% in Gabon and more than 32%, in Madagascar [30-35]. This discrepancy could be explained by the deep differences in the quality of health care according to countries. Severe pre-eclampsia is common in the Gynecology-Obstetrics Department of the Centre Hospitals-Universitaire of Bangui, the Central African Republic. This syndrome has resulted in a heavy burden in terms of maternal and fetal mortality and morbidity. Its management requires a multidisciplinary team with a well-codified protocol comprising the use of magnesium sulfate. Organisation Mondiale de la Sante (2010)Mortalite maternelle. Aide-memoire N 348: 1-5. Petit P, Top M, Chantraine F, Brichant JF, Dewandre PY, et al. (2009) Traitement de la pre-eclampsie sevère : jusqu’où, et pour quels risques/benefices ? Rev Med Liege 64: 620-25. Perrin RX, Lokossou A, Denakpo J (2010)Prise en charge multidisciplinaire de la pre-eclampsie : les propositions pour l’Afrique Noire. JGynecolObstetBiolReprod 39 :517-530. Cisse CT, Thiam M, Diagne PM, Moreau JC (2005) Pre-eclampsie en milieu Africain :epidemiologie et pronostic au CHU de Dakar. Lettre Gynecol 301: 8-13. Kartout L, Soummani A (2012) Les hypertensions arterielles gravidiques:etude retrospective au service de gynecologie obstetrique B du CHU Mohamed VI de Marrakec Marrakech. 1-150. Samake BM, Traore M, Goita L, Niani M, Traore Y, et al. (2011) Profilepidemiologique et clinique de la preeclampsiesevère au CHU Gabriel Toure. Mali Med 4: 5-7. Tchaou BA, Salifou K, Hounponou FM, Hountovo S, ChobliM, et al. (2012)Prise en charge de la preeclampsiesevère dans l’Hôpital Universitaire de Parakou (Benin). Soc AnesthReanimAfr Noire franc 17: 1-17. Coulibaly Klyna T(2014) Les complications de la preeclampsie en reanimation polyvalente du CHU de Cocody (Abidjan-RCI).RevAfrAnesth Med urgence 19: 1-7. Merger R, Levy J, Melchior J(2001)Precisd’Obstetrique. Paris Masson 6eme edition1: 1-559. Ngunga Nkondi M (2005) Pronostic maternel et fœtal au cours de la preeclampsie 1-79. Adisso S, Lokosou A, Konongui D, Olowusalako A, Perrin RX, et al. (2002) Severe vasculo renal syndrome: epidemiology and Prognosis. J SocAfr GynecolObstetrit 3: 1-6. Kongnyuy E , Tjek P, Kouam L, Ngassa P, Wamba M , et al. (2004) Cesaerians section from preeclampsia-eclampsia at the University teaching Hospital( CHU) Yaounde. Clin Mother Health 1: 66-67. Mboudou E, Foumane P, BellyPriso E, Dohbit J, Zeminkande J, et al. (2009) Hypertension au cours de la grossesse: Aspect clinique et epidemiologique à l’hôpital de Gynecologie-Obstetrique et Pediatrique de Yaounde. ClinicMother and childHealth 6: 2. Robillard P, Hulsey T, Penanin J(1994)Association of pregnancy induced hypertension with duration of sexual cohabitation before conception. Lancet 344: 973-975. Vinatier D, Prolongean J, Dufour P (1995)Physiologie de la pre-eclampsie : place de l’immunologie. J GynecolObstetBiolReprod 24: 387-399. Moignet C, Diemunsch P, Pottecher T(2003)Anesthesie-reanimation et pre eclampsie. Conferences d’actualisation 387-406. SibaiB (2003)Diagonstic and management of gestational hypertension and preeclampsia. J ObstetGynecol 103: 181-92. Duley L, Jhones S, Meher S (2013) Drugs for treatment of very high blood pressure during pregnancy. Cochrane Database Syst Rep 3: 144-149. Mage L, Cham C, Waterman E (2003)Hydralazine for treatment severe hypertension in pregnancy: meta-analysis. Biol Med J 327: 955-960. Cisse C, Faye-dienne M, Ngabo D, Mbaye M, Diagne P, et al. (2003) Indications therapeutiques et pronostic de l’eclampsie au CHU de Dakar. J GynecolObstetBiolRepro 32: 239-245. Lokossou A, Takpara I, Sacca-Vehounkpe, Tognide M, Sacca P, et al. (2005) Essai clinique du sulfate de magnesium dans la PE sevère et l’eclampsie en milieu Africain à Cotonou. J soc biol clin 9: 46-53. Roberts J, Villar J, Arulkumaran S(2002)Preventing and treatmenteclampsiaseizures. J Biol Med 325: 609-610. SFAR/CNGOF/ SFMP/ SFNN (2009)Recommandations formalisees d’experts communes. Haddad B(2001)Prise en charge de la pre-eclampsie. Mise à jour en GynecolObstetr 5-34. Toudjirob D (2013) Prise en charge de l’eclampsie dans le service de Gynecologie-Obstetrique [thèse]. Bangui : Universite de Bangui 1-81. Traore A, Maiga Y, Djiteye M, Coulibali M, Maiga D, et al. (2008) Etude epidemio-clinique et therapeutique de la crise d’eclampsie à l’Hôpital de GAO. Journal des abstracts de communication, SAGO, Bamako 128. Bourret B, Compere V, Torre S, Azhougagh K, Provost D, et al. (2012)Evaluation de l’utilisation de sulfate de magnesium dans la prevention secondaire de l’eclampsie : etude retrospective sur 39 cas. Annales Françaises d’Anesthesie et de Reanimation 31: 933-936. Brouth Y, Ndjeundo PG, Tetchi YD, Amonkou AA, Pete Y, et al. (2008) Les eclampsies au centre hospitalier universitaire en Côte d’Ivoire : prise en charge, evolution et facteurs pronostics. Can. J. Anesth 55: 423-428. Cisse CT, Faye Dienne ME, Ngabo D, Mbaye M, Diagne PM, et al. (2003) Indications therapeutiques et pronostic de l’eclampsie au CHU de Dakar. J GynecolObstetBiolReprod 32: 239-245. Lankoande J, Toure B, Ouedraogo A, Ouedraogo CMR, Ouattara T, et al. (1998)Les eclampsies à la maternite du centre hospitalier national YalgadoOuedraogo de Ouagadougou (Burkina Faso) : aspects epidemiologiques, cliniques et evolutifs. Med. Afr. Noire 45: 401-403. Mayi-Tsonga S, Akouo L, Ngou-Mve-Ngou JP, Meye JF (2006) Facteurs de risques de l’eclampsie à Libreville(Gabon) : etude cas temoins. Cahiers Sante 16:197-200. Rakotomahenina H, Rajaonarison T, Randriamahavonjy R, Randrianampanalinarivo H (2009)Pourquoi l’eclampsie engendre une forte mortalite ? Une etude dans la maternite de Befelatanana. Revue d’Anesthesie-Reanimation et de Medecine d’urgence 1: 25-27. Ben-salem F, Ben-salem K, Grati l, Arfaouilc, Faleh R, et al. (2003) Facteurs de risques de eclampsie : etude cas-temoins. Annales Françaises d’Anesthesie et de Reanimation 22 : 865-869. Copyright: © 2019 Ngbale NR, et al. This is an open-access article distributed under the terms of the Creative Commons Attribution License, which permits unrestricted use, distribution, and reproduction in any medium, provided the original author and source are credited.